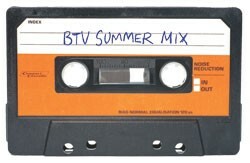 More than any other season, summer requires a soundtrack and at least one or two good anthems. While many will turn to the guilty pleasures of mainstream pop, we’d encourage you to add some local flavor to your summer playlists, too. After all, one can’t subsist on Kanye alone. So with that in mind, here’s a mixtape of some great new local music to blast in your Beats headphones, whether you’re laying out on the beach, straight floatin’ on a boat, or simply chilling in the backyard with a cocktail.